In a vineyard field experiment it was demonstrated that Saccharomyces cerevisiae yeast can be adsorbed from the soil by the roots of Vitis vinifera subs. vinifera and transported via vine to the stems and surface of the grapes. To exclude any extrinsic yeast contamination, the ripening grapes were sterilized and wrapped in plastic bags. Eleven active dried yeasts from different companies were then spread onto the vineyard soil. At four different time points, grape samples were taken under sterile conditions, crushed, and fermented without further inoculation. The yeasts in the fermented musts were characterized by PCR fingerprinting using the ITS region, testing whether they belonged to the Saccharomyces species. Then a microsatellite PCR was carried out with S.cerevisiae to demonstrate that these yeasts in the fermented must were from the same yeasts spread on the vineyard soil. The results showed that four of the eleven yeasts spread in the vineyard were transported via the vines onto the skin of the grapes. Commercial wine fermentation is either based on the addition of active dry yeast (ADY) or the use of wild yeasts leading to spontaneous fermentation. However, standard practice today is the use of commercial ADY. Saccharomyces cerevisiae can be used as a single strain culture or mixed with various non-Saccharomyces strains to achieve more aromatic complexity (Comitini et al., 2011). Spontaneous fermentation is based on indigenous yeast flora. The yeasts present on the surface of sound grapes (Barata, 2012; Pretorius, 2000) are a mixture of predominant non-Saccharomyces e.g. Pichia, Kloeckera, Metschnikowia and a very small number of Saccharomyces cerevisiae (Fleet et al., 2003; Comitini et al., 2011). Only 0.1 % of grape berries carry cells of S. cerevisiae on their surface. Damaged grapes, i.e. where the skin is broken, can have between 100,000 and 1,000,000 Saccharomyces cerevisiae cells on their surfaces (Mortimer et al., 1999). Normally, the presence of yeasts on the grapes of a given vineyard is influenced by the application of pesticides (Schildberger et al., 2007) and the vineyard’s “terroir” (Setati et al., 2012). The latter is characterized by different microclimates (Geier et al., 1960), soil composition, and fauna and flora – all factors with a major influence on wine quality. Yeasts in the soil are an essential part of a vine’s ecosystem, living close to its roots and interacting with them (De Azeredo et al, 1998, Botha et al., 2006). Metschnikowia, Hanseniaspora and other yeasts are often found in internal tissue of sugar-containing fruits, on the subsurface of metamorphically modified plant organs and starch containing seed lobes (Isaeva et al., 2001; Camatti-Sattori et al., 2005; Gai et al., 2009). These kinds of yeasts, especially the non-Saccharomyces, can play an important role during fermentation for achieving a complex wine aroma (Fleet et al., 2003). Saccharomyces yeasts are used in wineries to ensure steady fermentation (Blanco et al., 2011, Dittrich and Grossmann, 2005). A further factor influencing grape wine fermentation is yeast contamination from winery equipment, wine cellar walls and the cellar’s atmosphere (Mortimer et al, 1999; Mandl, 2010). However, it is still poorly understood how yeasts get onto the grapes in a vineyard. Previously it was assumed that rain could splash yeasts located in the soil up onto the grapes of low standing vines (Dittrich and Großmann, 2010). Stefanini et al. (2012) have shown social wasps as an important animal vector for S.cerevisiae. Insects can transport yeasts in their mandibles and on their legs to the grapes (Dittrich and Grossmann, 2010, Stevic et al. 1962). However, yeast infection of grapes via wind contamination – as often claimed – is doubtful. Investigations of yeast populations in wine cellars before and during the fermentation (Mandl, 2010) have shown that even the high yeast cell number in the cellar air would be too low to explain the high yeast cell number of 103 – 106 (Setati et al., 2012) observed on grape surfaces. Mortimer and Polsinelli (1999) have shown that S.cerevisiae is not airborne, but requires a vector to move, probably favoured by animal vectors (Goddard et al., 2010). Another study supposed yeasts to actually penetrate vines, stunt growth or even cause vines to die (Gognies et al., 2001). However the amount of yeast spores in the vineyard is low and most dominant fungi are not yeasts but Cladosporium spp., Alternaria spp. and fusiforme spores (Magyar et al., 2009). Setati et al. (2012) reported an important yeast diversity on grapes cultivated in conventional, integrated and biodynamic vineyards with significant highest diversity in biodynamic vineyards indicating an effect of pesticide spraying and/or soil cover and/or fertilisers. However, there are more conflicting theories. A number of researchers have found yeasts and fungi in plant transport systems within the vine (Kirchmair et al. (2010), Casieri et al. (2009), Schweigkofler et al. (1998), Gonzalez et al. (2011), Pancher et al. (2012) and von Tiedemann et al. (1988)). Schweigkofler et al. (1998) described Rhodotorula glutinis yeasts, a non-Saccharomyces species already detected in must during alcoholic fermentation (Guillamón et al., 1998), as well as Sporobolomyces roseus and other fungi such as Cladosporium, Alternaria Aspergillus and Penicillium in the vine. Other researchers have detected endophythic bacteria and yeasts on leaves (Last et al., 1965; Compant et al., 2011), including Pseudomonas, Xanthomonas and Flavobacterium. West et al. (2010) wrote about the bacterial endophytes of Vitis vinifera. Most of them were Bacillus spp. Pseudomonas spp. Curtobacterium spp. and Actinomyctes. The way Agrobacterium tumefaciens bacteria move was described by Tarbah et al. (1987), showing that they can move up to 30 cm within 24 hours in grapevine stems. Compant et al. (2005) tracked the movements of Burkholderia spp strain PSJN tagged with green fluorescent protein in tissue–cultured grapevine seedlings. Thorne et al. (2006) observed the light-producing bacterium Yersinia enterocolitica strain GY5332 within grapevines, while Chatelet et al. (2006) investigated the movement of Xylella fastidiosa in grapes. Bacteria can penetrate leaves via xylem (West et al. 2010), and it is also possible for certain microorganisms to penetrate grapevines via their endogalacturonase activities and pseudohyphae formation (Gognies et al., 2001). Several publications have further shown bacteria living as endophytes in plants. Rhizobia bacteria (Kui-Xian et al., 2009) can endophytically colonize tobacco plants, migrating inside their roots up to above-ground stems and leaves. This has similarly been shown in rice plants (Chi et al., 2005). Gai et al. (2009) root colonized sweet orange plants with various yeasts and detected later these yeast cells in the stomata and xylem of the colonized plants, reinforcing their endophytic nature. Kui –Xian et al. (2009) reported that endophytic rhizobia can exit tobacco leaf tissues through stomata and then disperse and actively colonize the phylloplane leaf surface. “Thus, Rhizobia can significantly alter their ecological niche by displaying a dynamic lifestyle, starting with free-living persistent bacteria in soil, then as rhizoplane epiphytes, followed by endophytic colonization within below-ground and above-ground plant tissues, and finally as phylloplane epiphytes” (Kui-Xian et al., 2009). In this study we focused on the question if yeasts might be transported through the vines from the soil onto grape surfaces. Eleven different commercially available yeast preparations were selected for this experiment after they had been shown detectable by microsatellite analysis (Silhavy et.al, 2006). These yeasts were rehydrated in 0.9 % saline solution and kept on Wallerstein Nutrient Agar (Oxoid LDT, Hampshire, England) plates. The eleven yeasts are listed in Table 1. The field site of 1200 m² was located in Klosterneuburg, Lower Austria, Austria (48°17.744 N/16°19.609 E) on a southern exposition at an altitude of 220 m. The mean temperature and annual precipitation were 9.5 °C and 1060 mm. The soil has been classified as a calcareous brown soil on flysch-marl with 12 % skeleton, 25 % clay, 38 % silt, and 37 % sand in the < 2 mm soil fraction. The vineyard has a grass dominated green cover (Festuca rubra, Lolium perenne, Melilotus, Trifolium repens). A band of 60 cm under the vines was treated twice during the season with an herbicide (Basta®). In 2010 no mineral fertilizers were applied. Within one vine row, 24 Grüner Veltliner (Green Veltliner) vines were selected for the field test. Planted at 1 m intervals and with a row spacing of 2.4 m in 1993, the vines have a strong, wide-ranging root system (Redl et al., 1996). The grapes from the selected vines were first sprayed with 70% alcohol to kill off any surface microorganisms, and then covered with sterile plastic bags to prevent any external yeast contamination of the grapes. For the first analysis, 11 consecutive vines were inoculated with the varying yeast solutions (Figure 1). For the second analysis, every second vine of 22 vines was inoculated with the yeast solutions for the repeated analysis (Figure 1). 5 g of each dry yeast was added to 1l individual bottles of pasteurized must and incubated at 20 °C for 24 h. Subsequently, the yeasts, rehydrated in the bottles, were poured on the soil 10 cm away from the sample vines in accordance with the test plan (Table 2, Figure 1). The labeled grape bags were collected 4, 11, and 18 days after inoculation. Every week one plastic bag was cut from each sample vine in accordance with the test plan (Table 1) and taken to the laboratory where the grapes were crushed manually under sterile conditions in the original plastic bags. The must obtained was poured into sterile vessels and fermented spontaneously at 25 °C. Fourteen days later, yeast selection was performed, with juice samples being diluted in 0.9 % saline solution and then streaked on Wallerstein agar plates (Oxoid LDT, Hampshire, England). After incubation at 25 °C for 48 hours, all creamy-white colonies were isolated. DNA purification of the isolated yeast and the eleven reference yeast strains was carried out using the MasterPureTM Yeast Purification Kit (Epicentre Biotechnologies, Madison, USA) as described by the manufacturer. The yeasts isolated by their morphology as Saccharomyces were identified by PCR amplification of the ITS region with the primers ITS1 and ITS4 according to White et.al. (1990). To identify the yeasts as the commercial yeast strains that were used for the inoculation, a microsatellite PCR analysis with the primers C5, C11 and SCYOR267X was carried out according to Legras et al. (2005). The isolated yeasts were then compared with the eleven reference strains. It is important to take into account that wine sediments (lees) are often removed from the wineries and spread in the vineyards. This means that yeasts leave the cellar, hibernate outside (Valero et al., 2005) and might surviving in crannies and in the soil. At harvest time these yeasts could re-inoculate grapes, returning to the winery in the coming year with the harvested grapes (Blanco et al, 2011; Ocón et al, 2010). However, in this experimental vineyard no lees had been applied in the past few years (oral statement of Mr. Mehofer, head of viticulture), meaning that any risk of cross-contamination from the winery or other field trials can be excluded. The reference yeast (Oenoferm Klosterneuburg) spread out under the vines 11, 14, 30 and 36 was detected on the grapes of vines 14, 18, 20, 22 and 32. The yeast Coll. Cépage Chardonnay spread out under vines 13 and 34 was detected on vines 13 and 40. Oenoferm Bouquet spread out under the vines 15 and 38 was isolated on vine 38. Maurivin AWRI 350 was poured out under the vines 7 and 22 and was detected on vines 16 and 22 (Figure 1). In some cases, we detected the yeast on the same vine under which the yeast was spread, while on others we isolated the yeasts on vines a few meters away from where it had been applied. This can be explained by long roots, since in older vineyards a vine’s root system can have a circumference exceeding 15m (Redl et al., 1996). Certain commercial yeasts were isolated twice on the grapes of the same vine at different points in time. The study confirmed twice the identical detection of Oenoform Klosterneuburg yeast on the same vine, and once for Maurivin 350 and Coll. Cépage Chardonnay yeasts. Yeast on the originally inoculated grapevine was detected three times (Figure 1). Microsatellites represent practicable ways of identifying special yeasts. Silhavy et al. (2006) and Legras et al. (2005) have described the possibility of identifying commercial yeast with just a few markers. In more general terms, microsatellite PCRs provide very constant and well-reproducible results. In this trial the experimental yeasts were chosen on the basis of results by Silhavy et.al. (2006). Two characteristics of the yeasts used corresponded clearly with the microsatellite pattern and were easily identified on an agarose gel. A 100 Bp ladder was placed in aisles one and sixteen of the microsatellite pattern. The reference yeasts between the two aisles matched with those isolated yeasts from grapes of the vine. Coll. Cépage Chardonnay was compared with the selected yeast of vines 13 and 40, the reference yeast Oenoferm Klosterneuburg with isolated yeast of vines 14, 18, 20, 22 and 32 and Oenoferm Bouquet with the yeast of vine 38. 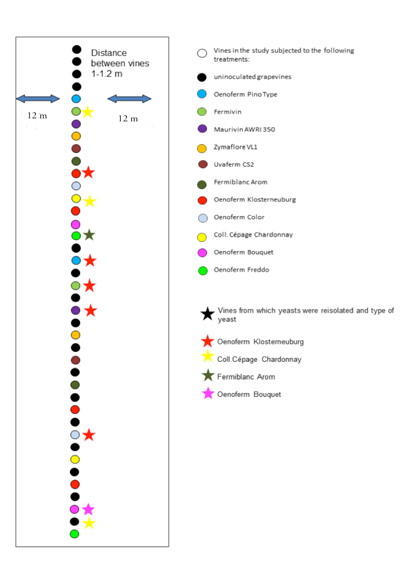 The compared bands of the reference yeasts showed a good conformity with selected yeasts (Figure 2). Yeasts live near roots (Botha et al., 2006) and can often be isolated in and on vines (Schweigkofler et al., 1998), on leaves (de Azeredo et al., 1998) and on fruit (Camattori-Sartori et al., 2005). Camattori-Sartori et al. (2005) described the isolation of yeasts in apple trees cultivated in different ways (conventional, integrated, and organic), whereby the greatest number of endophytic isolates was obtained from orchards under organic cultivation. Sporidiobolus pararoseus and Rhodotorula mucilaginosa were isolated in leaves (de Azeredo et al., 1998), while Debaryomyces hansenii and Cryptococcus laurentii were found in the blossoms and leaves, and Candida in the leaves and apples. Pichia spp. was only identified in the apples themselves in an integrated farming system. Saccharomyces cerevisiae yeasts were, in a small number of cases, isolated on sugarcane leaves and stems and in the rhizosphere (de Azeredo et al., 1998). In our study, it has been shown for the first time and thus proven our hypothesis that vines can take up yeasts from the soil and transport it through the vine to the stem and skins of grapes in the pre-harvest season. The yeast took longer than one week to pass from the soil to the grapevine stem. None of the yeasts applied in the vineyard was detected on the first sampling after 4 days, but on the second sampling after 11 days (Table 1). It is assumed that the transport speed of the yeasts through the xylem is similar to that of bacteria, though this is a hypothesis needing more investigation. According to the results obtained it has been shown that soil microorganisms use an endophytic way to get transported via roots and stems to the surface of grape berries. Spontaneous fermentation is frequently used with the purpose to improve regional flavor characteristics (terroir) (Westhuizen et al., 2000). Soil born yeast taken up by vine roots and transported via vine to the grapes and stems may thus have a direct influence on the expression of terroir and regional wine flavor derived from yeast metabolism during alcoholic fermentation. As fungicides regularly applied to vineyards are thought to have an influence on yeast and yeast diversity (Cordero-Bueso et al., 2011; Schmid et al., 2011; Setati et al., 2012; Tofalo et al., 2010) these results may indicate an indirect influence of pesticide application on wine quality. Especially the use of systemic pesticide treatments of plants which may weaken endophytic microorganisms (Schildberger et al., 2007) and may thus have a detrimental effect on yeast and yeast diversity on stems and grapes. The interaction of pesticides and herbicides with local yeast populations merits further investigations. Cordero-Bueso, G., Arroyo, T., Serrano, A., Tello, J., Aporta, I., Vélez, M.D., Valero,E. (2011) Influence of the farming system and vine variety on yeast communities associated with grape berries. Int. J. Food Microbiol. 145, 132–9. 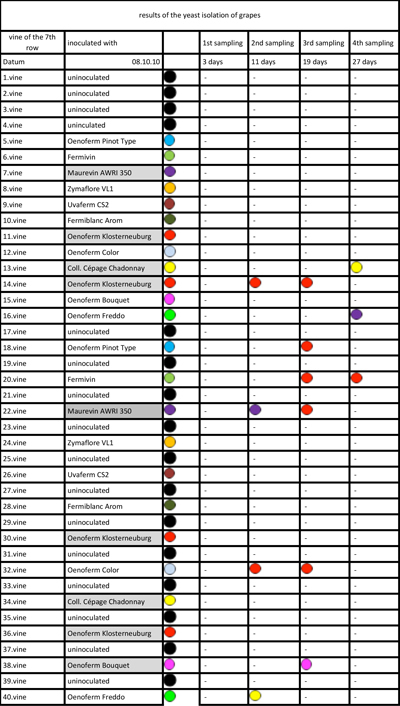 Goddard, M.R., Anfang, N., Tang, R., Gardner, R.C., Jun, C., (2010) A distinct population of Saccharomyces cerevisiae in New Zealand: evidence for local dispersal by insects and human-aided global dispersal in oak barrels. Environ. Microbiol. 12, 63–73. Guillamón, J.M., Sabaté, J., Barrio, E., Cano,J. and Querol,A. (1998) Rapid identification of wine yeast species based on RFLP analysis of the ribosomal internal transcribed spacer (ITS) region. Arch Microbiol.169 (5):387-92. Schmid, F., Moser, G., Müller, H., Berg, G., (2011) Functional and structural microbialdiversity in organic and conventional viticulture: organic farming benefits natural biocontrol agents. Appl. Environ. Microbiol. 77, 2188–91. Tofalo, R., Schirone, M., Telera, G.C., Manetta, A.C., Corsetti, A., Suzzi, G., (2010) Influence of organic viticulture on non-Saccharomyces wine yeast populations. Ann. Microbiol. 61, 57–66. White, T.J., Bruns, T., Lee, S. and Taylor J. (1990) Amplification and direct sequencing of fungal ribosomal RNA genes for phylogenetics. In: PCR Protocols: a guide to methods and applications. (Innis MA, Gelfand DH, Sninsky JJ, White TJ, eds). Academic Press, New York, USA: 315–322. This entry was posted on Saturday, April 4th, 2015 at 01, Apr and is filed under winegrowing and oenology. Am 28. May 2015 um 16:56 Uhr Title: Dr.
Herzlichen Dank den Autorinnen und Autoren für diese hochinteressante Untersuchung und den Bericht! Das feine Zusammenspiel zwischen Organismen, hier die Endosymbiosen von höheren Pflanzen, Hefen und anderen Mikroorganismen erfahren immer mehr Aufmerksamkeit. Zu Recht, geben sie uns doch entscheidende Hinweise für gute, nachhaltige Kulturweisen. Die greift der Bericht sehr gut auf. Der Nutzen des innerpflanzlichen Transports für die Mikroorganismen scheint mir auf der Hand zu liegen. So gelangen sie frühzeitig auf Früchte und Blätter als künftige Lebens-und Nahrungsräume. Gibt es auch Überlegungen zum Nutzen für die Pflanzen? Eine Besiedlung von Blütennektar durch Hefen kann z.B. Bestäuber anlocken. Hier geht es aber um Trauben und Blätter. Könnte eine “gelenkte” Edelfäule der Trauben – im Unterschied zu einer unkontrollierten Verrottung – Vorteile z.B. durch Zoochorie, Fraß und Verbreitung der Samen durch Tiere bewirken? Wenn es dazu Hinweise gibt, wäre ich für eine kurze Information sehr dankbar. Die Initiativen im Ithaka-Institut halte ich für unschätzbar hilfreich und dankenswert. Alles Gute weiterhin! Sehr geehrter Herr Siepe, das Feld der “symbiotischen” Hefen, die über die Wurzel aufgenommen werden, ist noch ganz und gar neu. Da wird es noch sehr viel zu entdecken und zu verstehen geben. Ihre Vermutungen könnten durchaus stimmen, aber wir haben dafür derzeit leider noch keine stichhaltigen Hinweise und Daten, nur Vermutungen eben, aber die werden uns noch viele Schritte weiterbringen. Herzlichen Dank, Herr Schmidt, für Ihre rasche Antwort! Gerade wenn die Forschung noch neu ist, ist es umso wertvoller, dass sich Ihr Team in Instituten aus der Schweiz, Österreich und Deutschland gemeinsam mit dem Thema befasst. Synergien von Hefen, Pflanzen, auch Bestäubern und Weidetieren wurden in Ansätzen schon vor Jahrzehnten untersucht. Sie scheinen aber doch noch wenig im allgemeinen Fokus zu liegen. Hier kann Ihre Initiative neue Türen zu ungeahnten Entdeckungen öffnen. Danke für Ihre Innovationen und weiters Alles Gute! The mechanisms by which beneficial microbes support plant growth and health include increasing nutrient availability, improving soil structure, inducing plant defense mechanisms, producing antibiotics, outcompeting pathogens, and providing growth-stimulating substances or enzymes. Strain PsJN also shows biocontrol activity against gray mold since it can effectively protect against in vitro and in vivo growth of Botrytis cinerea. Also, endophytic Burkholderia species have received increased interest in the last years because of their capacity to fix nitrogen and their potential to promote plant growth. Burkholderia species have been isolated from several crops (5, 79), including sugarcane (61), rice (23), wine plants (18), onion (75), maize, and coffee (26, 27). Burkolderia hilft also nicht nur bei der Krankheitsabwehr, sondern liefert auch noch wichtigen Dünger in Form von pflanzenverfügbarem Stickstoff.